Whether you’re a seasoned developer, or just getting your chops, APIs can be a great way to quickly move your app idea from the drawing board and onto the world’s devices. In case you don’t already know, API stands for “application programming interface.” APIs govern how one application can talk to another, and are largely how data gets shared across the web. They enable developers to “piggyback” on the offerings of another service (like when a non-Google app shares a Google map with you). API’s are a quick way to get and manipulate data from other web services for your app or site. It’s also common to create “mashups” using the overlapping data from multiple APIs (such as geospatial data) to create new functionality. Here’s our list of 50 of the most useful APIs for developers, as well as resources on how to use them efficiently, and some inspiration at the end. In one way or another, Google APIs support most modern sites online. From analytics, to the advertising exchange, maps, to Google+ shares, chances are, most sites are using a Google API. Currently, 57 APIs are available from Google, as well as a number of other developer tools. Tutorials abound if you find an API of interest, and for more general inquiries, developers should check out this basic project by Google on using APIs. • Google APIs: An ever-changing list of 57 Google APIs. • Google Analytics API: Measure user interactions with your site or app across multiple devices. • Youtube API: Choose from the data or players API to embed types of players or offer Youtube search capabilities. • AD Exchange Seller API: Enables you to manage your Ad Exchange Seller Account. • Picasa Web Albums API: Allows websites and apps to integrate Picasa Web Albums by creating albums, uploading or retrieving photos, and more. • Blogger API: View and update blogger content, query for posts that match criteria. • Google Fonts API: Use a variety of custom fonts from Google on most modern browsers. • Google Geocoding API: Create interactive maps with Google Maps. Though not as numerous as Google’s APIs, Yahoo has a number of valuable APIs including Flickr (below in the social media section), a Yahoo marketing API, and Yahoos RSS feeds. Yahoo’s connected TV API is a unique starting point for creating smart tv apps for advertising, content, and video. 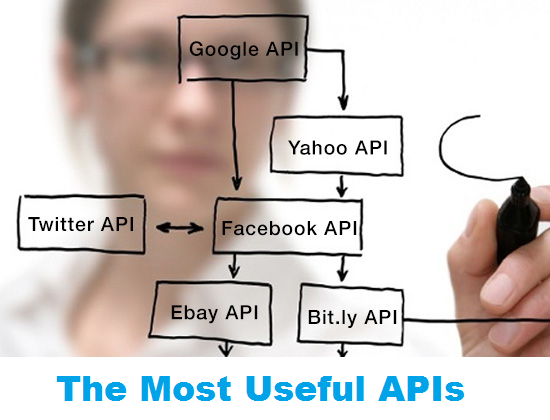 • Yahoo APIs: Yahoo’s 7 APIs can be coupled with a variety of their other web tools and development platforms. • Yahoo RSS Feeds API: Enables users to pull up content from sites sharing new posts on Yahoo RSS feeds. • Yahoo APT API: Buy and Sell advertising on Yahoo through this API. • Yahoo Search Marketing API: Allows access to Yahoo marketing data for managing marketing campaigns. Social media APIs are used for a variety of reasons. The ability to log into a site using a social media profile helps users quickly access content, and keep the number of separate accounts and passwords they have to keep track of low. The ability to instantly share content socially, can be a great boom to app or site engagement, and the ability to look at social media data and key into your true audience is always valuable. • Twitter API: Enables an app to interact with most of Twitter’s functions. • Scoop.it API: Find data on scoop.it users, topics, and posts. • Facebook APIs: For ads, games, payments, login, sharing stats, and user data. • Linkedin API: Enables apps to connect to user accounts, data, connections,groups, communications, and social streams. • Google+ API: Enables apps to login to Google+ view connections, groups, posts, and contact information. • Pinterest API:Enables apps to view the most clicked-through or repinned Pins, view related posts, and user profiles. • Tumblr API: Create new ways to use Tumblr with access to content, likes, followers, and drafts. • Instagram API: Search photos by location, user, tags, view trending photos, and make custom items. • Flickr API: Search through user Flickr content, contacts, upload or replace photos. • Meetup API: Integrate Meetup groups and the corresponding data with larger apps or websites. Marketplace APIs can be well utilized in mashups, as a way to automatically post your site’s goods on other marketplaces, and as a way to direct users to related goods. 3Taps API is particularly powerful, allowing access to 7 separate mostly marketplace APIs, and in the process of adding more functionality at the moment. • Foursquare API: Use the API to access Foursquare’s places database detailing users and merchants. • eBay API: Search eBay categories, post things for sale, display eBay listings on other sites, and search bidder information. • 3Taps API: Allows access to Craigslist, apartments.com, Indeed, eBay Motors, cars.com, Hemmings Motor News, and Backpage APIs. • From Census data to weather to posting videos, there are tons of interesting and valuable APIs out there. Here are a few of our favorites. • Census API: Access vast datasets from the census on demographics, population, and economic data. • SoundCloud API: Build apps that allow users to upload and share sound online. • Klout API: This API gives you “social influence” scores for people based on their social media profiles, followers, and activity. • Tastekid API: This API allows you to integrate suggestions for music, movies, shows, and books based on their suggestion database. • Bit.ly API: Shorten URL’s, search and analyze links with this API. • Weather Underground API A database of reliable forecast and weather data in 80 languages. • YR.NO API: The largest weather database in the world. NOTE: Requires translation from Norwegian. • WordPress API: A variety of ways to extend WordPress through plugins. • Yelp API: Find geographically-oriented data, search by highest ratings, distance from location. • Dropbox API: Allows your app to sync files and data with Dropbox, giving you access to the Dropboxes of over 300 million global users. • Janrain API: Tools to recognize customers across platforms, offer single sign-on, and social login. • Amazon S3: Use Amazon storage to utilize your own API. Free tier includes 5GB storage, 20,000 Ger Requests, and 2,000 Put requests. • Europeana APIs: Build applications that utilize a wealth of cultural heritage objects in the Europeana repository. Here’s some inspiration on what can happen when you couple the power of a few APIs. Valuable mashups can be as simple as using a site’s API and redesigning the interface through which users view the data. Oftentimes mashups look at overlapping data from multiple APIs to pull out new relationships. • Trendsmap: Utilizes trending twitter hashtags with geospatial data, providing a live map of trending tweets. For a membership fee, historical data, higher levels of zoom, and analysis are available. • Poligraft: Enables users to place links to articles or copied pieces of text to receive the back story on political figures mentioned. • Spell With Flickr: Takes a word or string of words as input and creates a “ransom note” of different Flickr images for each character. • Housing Maps: Is a mashup between Craigslist and Google Maps that provides an interactive map of properties for rent or sale. Even for seasoned developers, individual APIs can have their quirks. The best place to look for detailed information on an API is on their home documentation page. The tutorials below range from beginner to intermediate, with the first link not requiring any programming, and the following links detailing how to use jQuery and AJAX (a common way to tap into API data) as well as principles for properly using API data and using RESTful methodology. Needless to say, it takes a lot of work to become an API master. • Using APIs Without Programming This tutorial looks at some simple ways you can reverse engineer an organization’s data to figure out URLs where data is held. • CodeAcademy’s jQuery and AJAX course: Is a good introduction to jQuery and AJAX which can be used to interact with APIs. • Creating an API-Centric Web App: Here’s a guide detailing how to create an app that centers around API calls. • REST API Tutorial: A tutorial on the basics of using RESTful web architecture principles.